Last month H&F Council hit the headlines in most of the national and local press for possibly operating outside UK tax laws and building up an estimated tax debt of £15m. In almost every article featuring H&F Council there was also a quote from the Rt Hon Eric Pickles MP (Con), the Communities and Local Government Secretary. 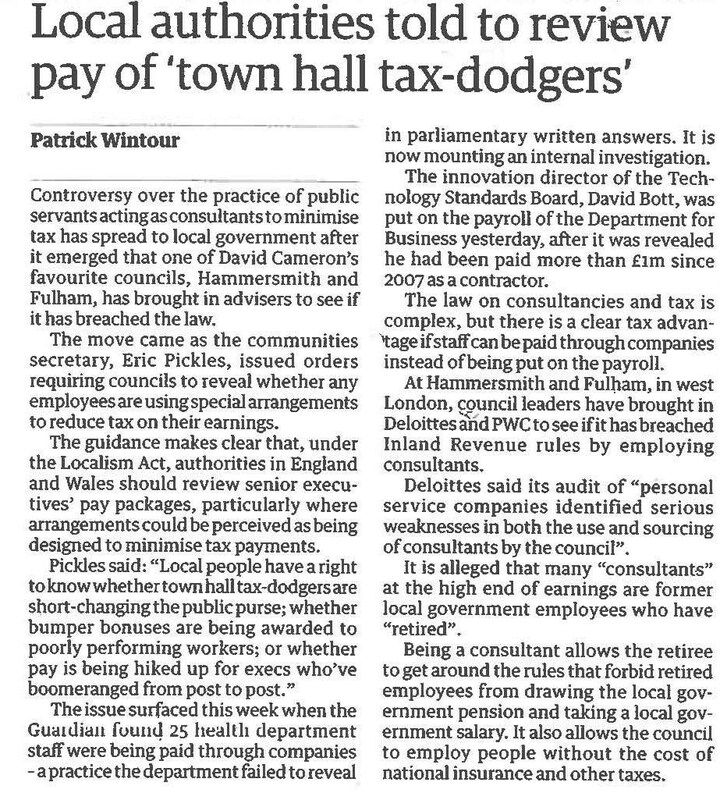 He announced to the media that he would personally be cracking down on Town Hall tax dodgers saying: "Local people have a right to know whether town hall tax-dodgers are short-changing the public purse; whether bumper bonuses are being awarded to poorly performing workers; or whether pay is being hiked up for execs who've boomeranged from post to post." My Labour colleagues and I first raised these matters in 2010. 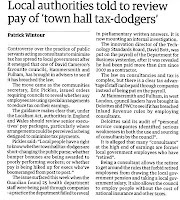 H&F Conservatives have had to be dragged kicking and screaming into even considering their dubious employment of "consultants" as full time employees or ensuring the resulting tax problems are properly dealt with and in order. Yesterday, Hammersmith's Andy Slaughter MP (Lab) took all this to parliament when he arranged a Private Member's Debate titled Pay and Consultants (Public Sector). You can read his excellent speech here in Hansard. So will Mr. Pickles act and investigate a council he has previously described as the "apple in his eye"? There is of course the law and then there's the spirit of the law. H&F's Conservative Administration appears to be operating outside of both in this instance and may therefore have put all local tax payers at risk of having to fork out for fines as well as back taxes. Words are easy, now it's time for the government to sort all of this out.